Ah, a vacation you can take in the middle of the ocean. It’s possible and it’s called a ‘cruise’, which you probably already knew. But if you’re not sure what it is, a cruise is a ship that takes on a voyage to a destination or a few, usually for pleasure. Most people I personally know have never been on a cruise yet. 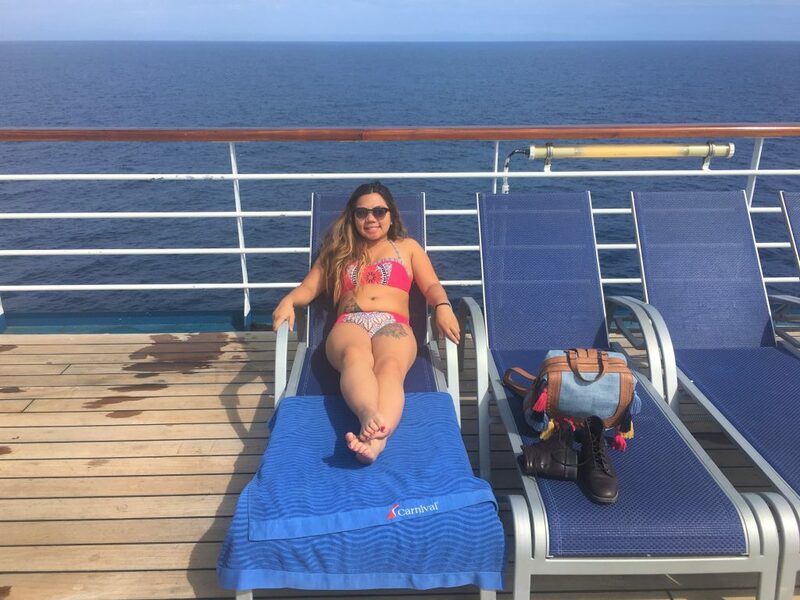 Most people probably don’t know how eventful and fun a cruise can truly be until they’re actually on one. That’s how it was for me. When I was younger, my parents were huge into cruise vacations and would take my siblings and me on them, and to be honest, it’s very exciting. Imagine your hotel room is in a moving ship for a few days, with no land to walk on but on decks. 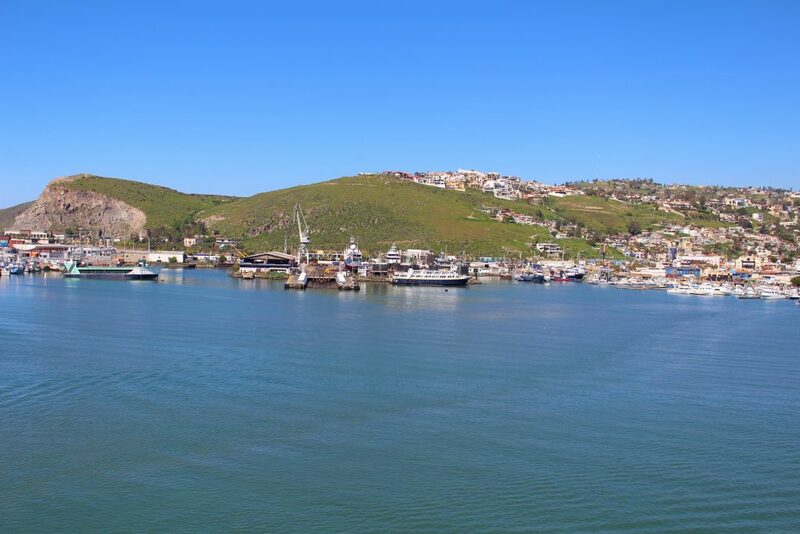 With no cities to explore right outside of your hotel room but to an island or destination with a port for ships. With your window views of the ocean and not a skyline. I can recall being on 5 cruises before, the 5th one is my most recent one. Getting ready to sail away from Long Beach, California! 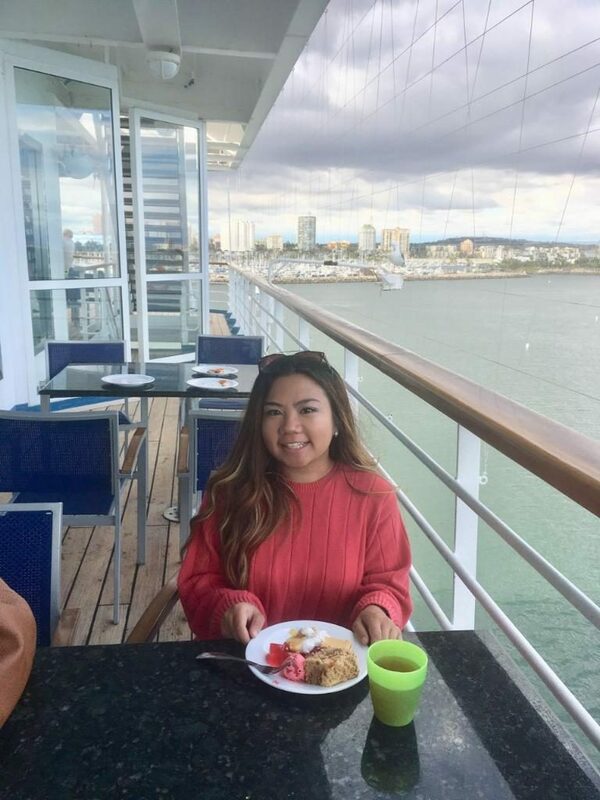 My last cruise took place in Long Beach, California to Catalina Island and Ensenada, Baja, Mexico with my parents, which took place the first week of this month. We road tripped from Arizona to Long Beach, California to go to the port. The last time I was on a cruise before this was nearly 5 years ago. Since it has been a long time, the feeling of experiencing a cruise all over again felt refreshing. A refreshing way to travel, indeed. As you probably already know, there are different cruise companies that offer cruises to everyone. The most common ones in America are Carnival, Norwegian, Royal Caribbean International, Holland America, Princess, just to name a few. The only ones I’ve tried were Carnival and Norwegian and this last one took place on Carnival (Highly recommend! You’ll see why in this post.). 1. You’ll have to work with a budget… only when it comes to extra things and excursions. But sometimes, you’ll get a lot of value for the price. If there’s anything I like providing to people, it’s honesty. 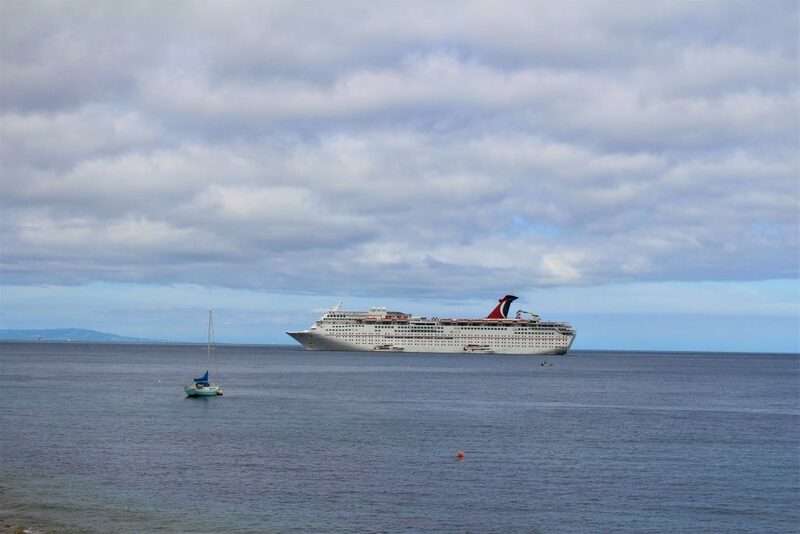 Cruise lines admire marketing and are definitely using it to their advantage. They’ll offer affordable, low up-front prices that will grab your attention and pull you in. It’s tempting especially since you’ve probably read all there is to the itinerary and accommodations provided on the cruise ship. 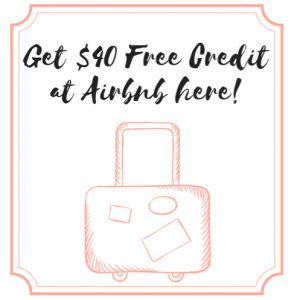 However, understand that you may have to pay extra for everything else such as drinks, room service, spa experiences, retail products, laundry, internet, and shore excursions. 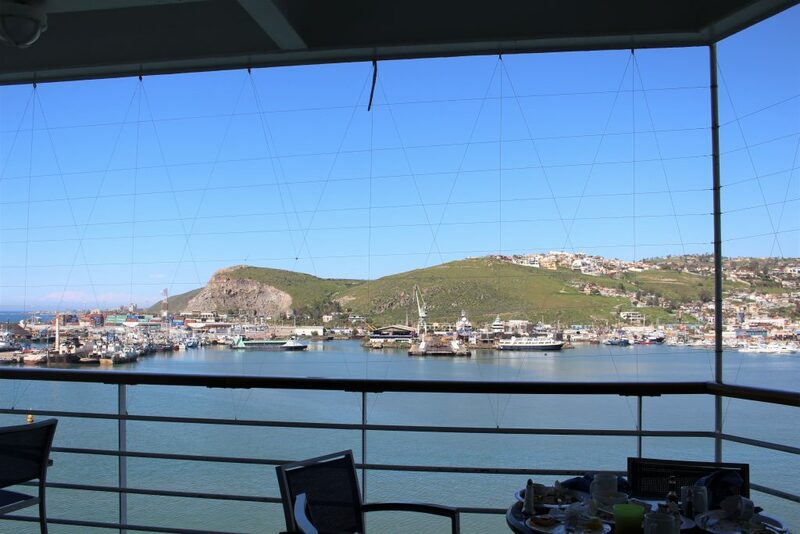 In my cruise experiences, food from breakfast to lunch to dinner, the lodging, and entertainment are all included as free when you pay for the up-front costs. You may even be given a certain amount of credit in a card that will be given to you and it will act like your spending account. After you spend that credit, you’d have to put more in. In this case, you can’t forget to bring more cash and be realistic of how much you’ll spend on the cruise and on excursions when you visit your destinations. YES to free food and fine dining! 2. There’s plenty of entertainment on the ship. You’ll have to actually connect with people. After all, you won’t have Wi-Fi. 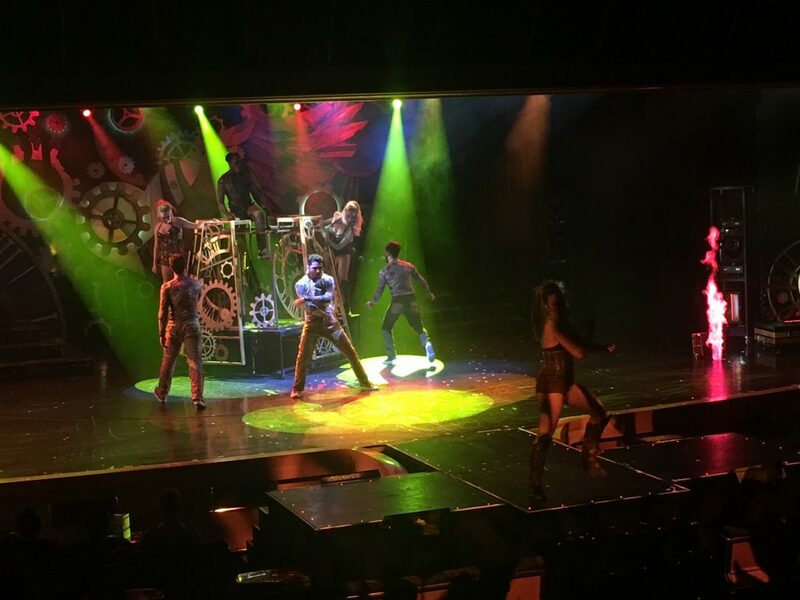 One of the biggest things that made a cruise vacation fun for me is the number of fun entertainment that can be found on the ship. 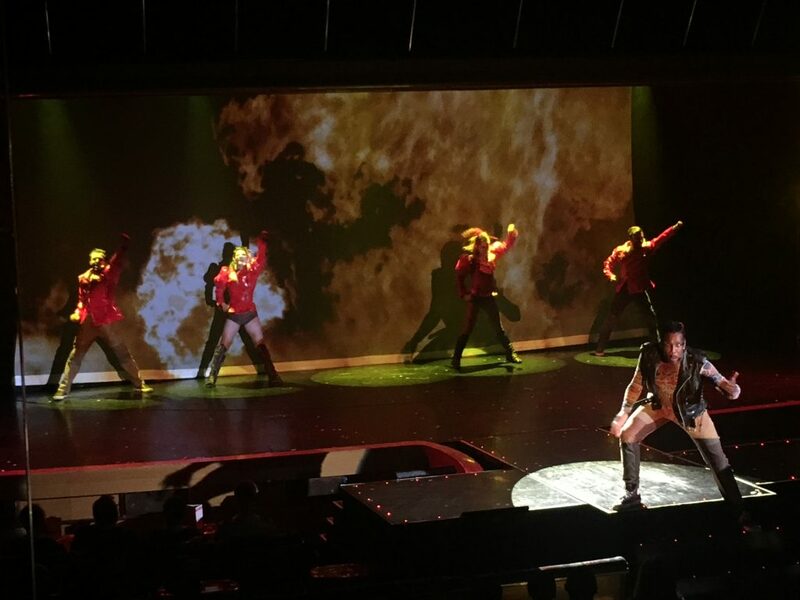 Every night on my last cruise, there was a Broadway-inspired show being performed at a huge auditorium looking room with dancers and singers. Every day, there was live music performances played by the bars. As someone who appreciates live performances, I seriously loved every minute of it. They also host competitions, bingo contests, slot tournaments, and more. There are also events that will be held through the ship, targeted to family, children, and even single people (a single mixer, perhaps?). Also, depending on the time of the year that you’re on a cruise, there will be events held specifically for a holiday. 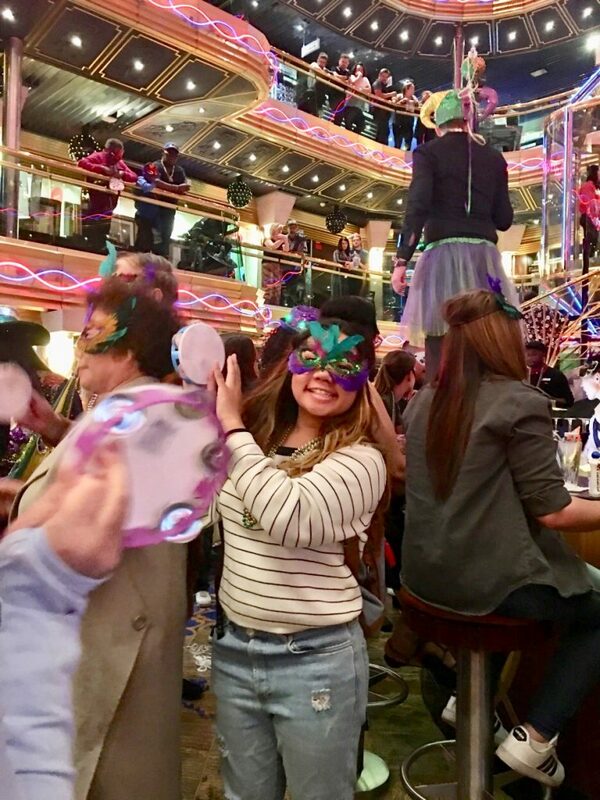 On my last cruise, Mardi Gras fell on the same day I was sailing through the sea and I joined an exciting parade and after party at the lobby that served King Cake! You can never find yourself bored, especially since there won’t be any Wi-Fi service on the cruise ship… unless you pay for it! But it’s usually never worth it. You’ll have to make face-to-face connections with people on the ship instead! It’s awesome. If none of those appeals to you and you want ‘alone’ time for yourself, most ships have a gym you can get access to, a pool (usually it consists salt water from the sea — I actually love this because there’s no chlorine smell to it and it’s always fun to pretend you’re swimming in the sea — the irony), and lounge chairs to relax or sunbathe on. There’s also the casino. 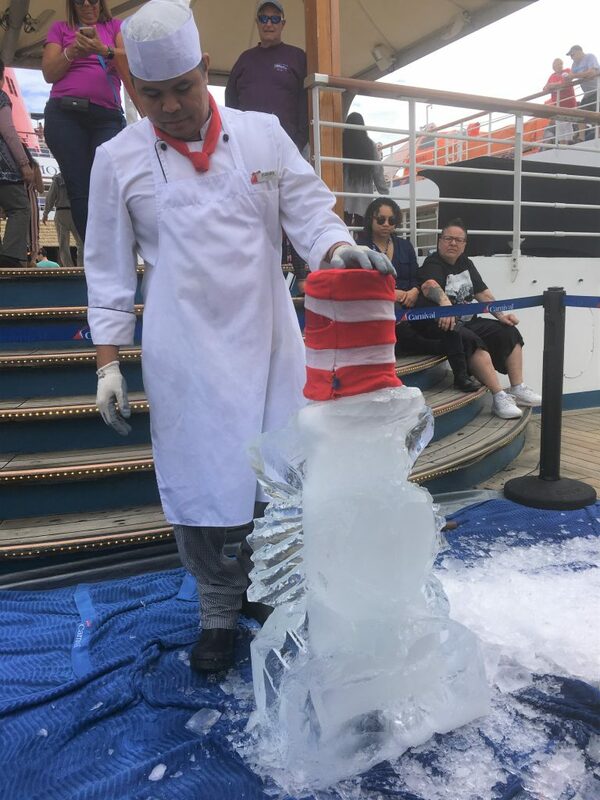 Yep, this guy did an ice carving of The Cat in The Hat! 3. You’ll wake up in a new country or some other location and have the option to explore away! This is the most exciting part of a cruise, especially if you already consider yourself an avid traveler. 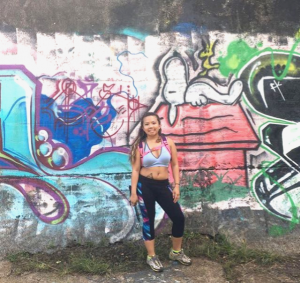 I love the idea of waking up early, picking the right outfit and gathering the essentials for a day to a location that allows me to actually walk around on land, having breakfast, then hopping off the ship to explore that location. You’ll have to bring your ship card with you and passport/license though. Also, you’ll have options to book excursions with your cruise line or within the location outside the ship, which is the cheaper option. Be wary though, you’ll have to keep in track of how long a tour will last and the time you have to get back on the ship (pay very close attention to this because ships do not always wait for you and may sail off without you!). This is where a disadvantage can play upon an avid traveler though. You sometimes won’t have all day to explore a certain location and there will only be a couple of hours required. 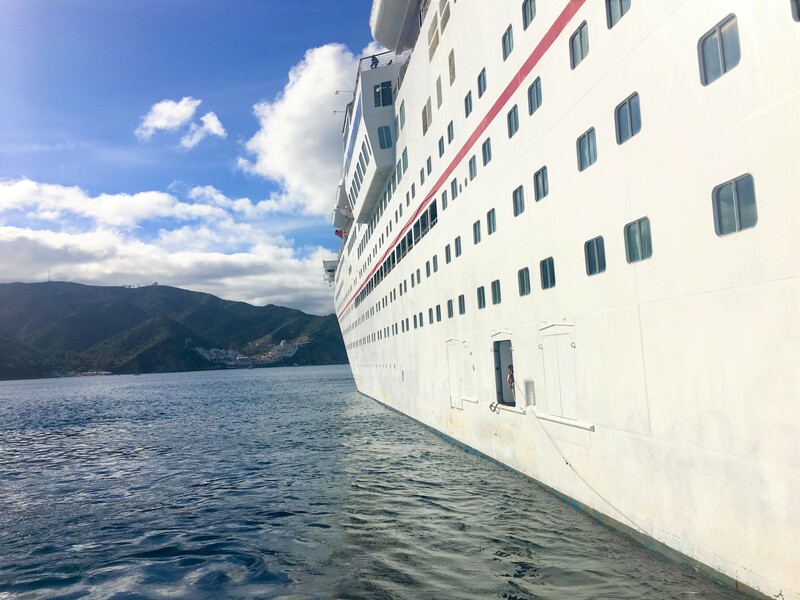 Depending on when you get off the ship to explore, sometimes exploring might feel rushed. My tip: get off the ship in the very first hour you’re available to. There may also be lines to take a shuttle boat to the location. 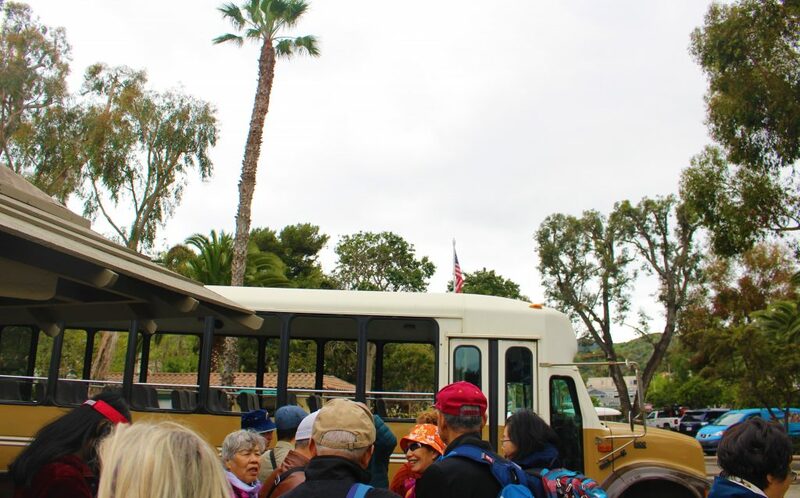 Time to hop on this tour bus in Catalina Island! 4. You’ll get to relax most of the time and you’ll meet some of the friendliest staff that will make your trip comfortable. After the initial checking in process and rolling your luggage in your bedroom as you enter a ship, you are now free to do what you want. Don’t want to get involved in an event or any entertainment? No problem, you can stay back in your bedroom and just watch TV… or read a book. Want to get started on a swim and go tanning? No problem, head to the pool deck. Feeling hungry? 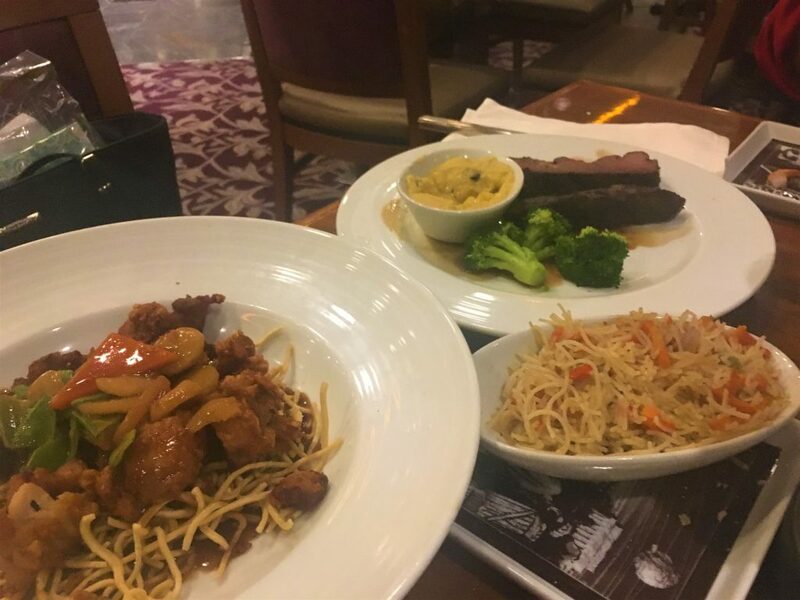 No problem, grab some food from the buffet already. The choice is yours. The only time you won’t be able to relax as much is if you’re not used to the feeling of a boat rocking back and forth and if you suffer from sea/motion sickness. 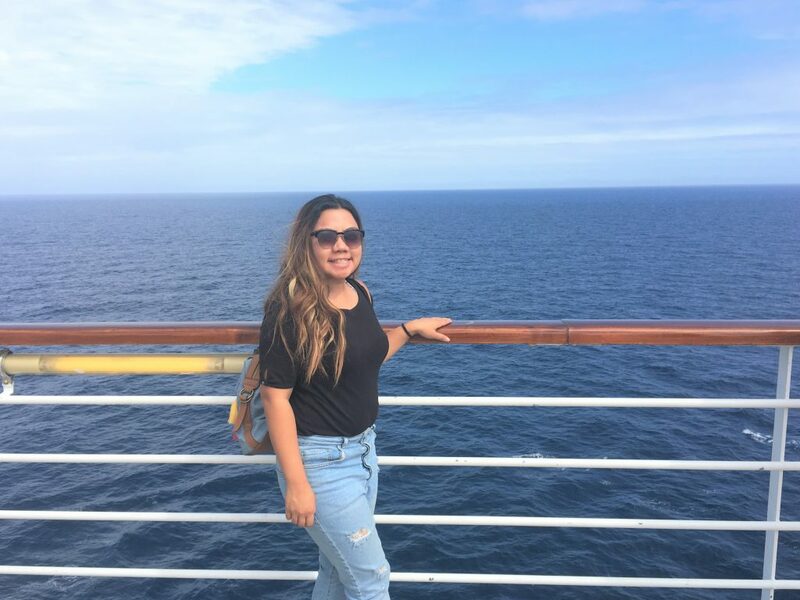 When I first went on a cruise, the feeling for me was horrendous especially as one who experiences motion sickness easily. Luckily, I have some tips here on how you can deal with motion sickness to help you with this issue. What I find that a cruise will make sure to make you feel comfortable at most is the staff itself. They are the friendliest and most helpful people you will meet and will direct you with any assistance in any way. Even if you have to ask the dumbest questions. 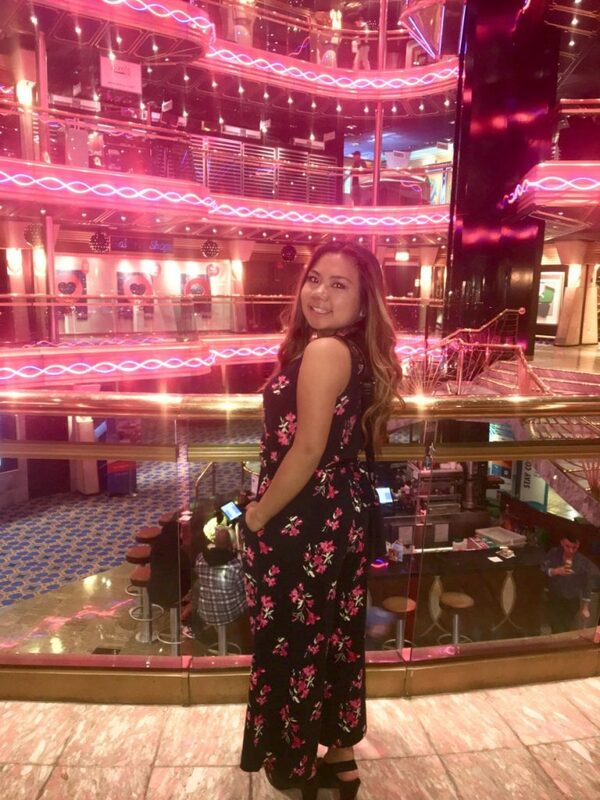 You might end up making really good connections with the cruise staff and share stories and laughs with. From what I’ve witnessed, they will even want to throw you some entertainment on your first and last day when you do fine dining with a “goodbye” performance… or even just to make you dance with them! 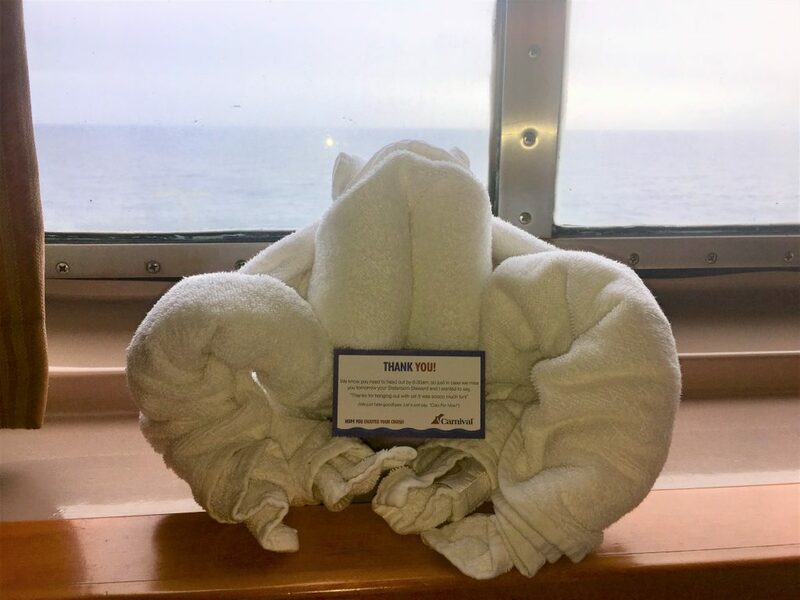 Isn’t this little towel guy cute? 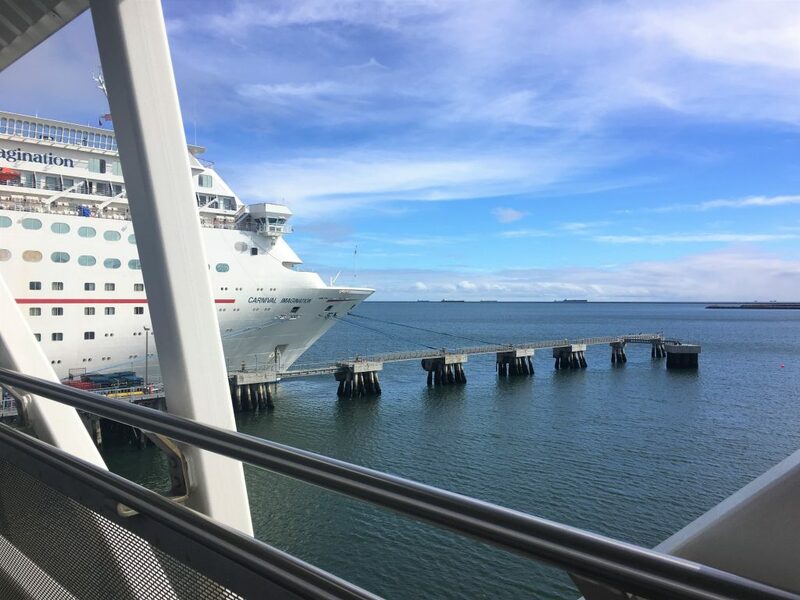 There may be other factors to help you consider if a cruise vacation is meant for you, but those are the most important ones to consider. I promise you that it’s different from just staying in a hotel and it’ll leave a fun memory for you. Whether you go solo or not, you’ll be bound to meet people from all over the country… and all over the world (a lot of the staff members are from abroad). However, a cruise is fun if you can stay open-minded and cherish the hard work and tourism that it all has to offer. 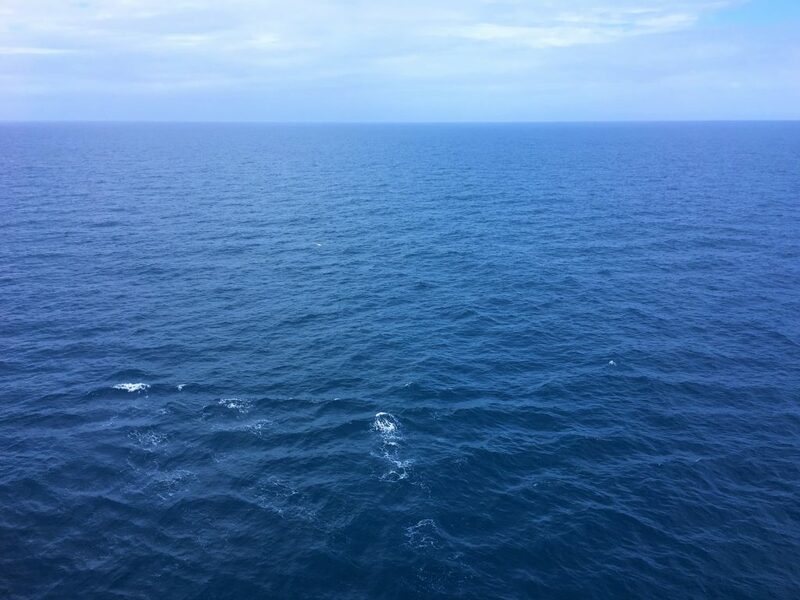 Being out in the deep sea, where it actually feels lonely to be in (think about it), will not feel like that when you find yourself in a cruise. If you would like to gain more information, tips, and recommended destinations on cruises, I suggest Lonely Planet’s The Cruise Handbook. I’m pretty sure I have been on this exact cruise before! 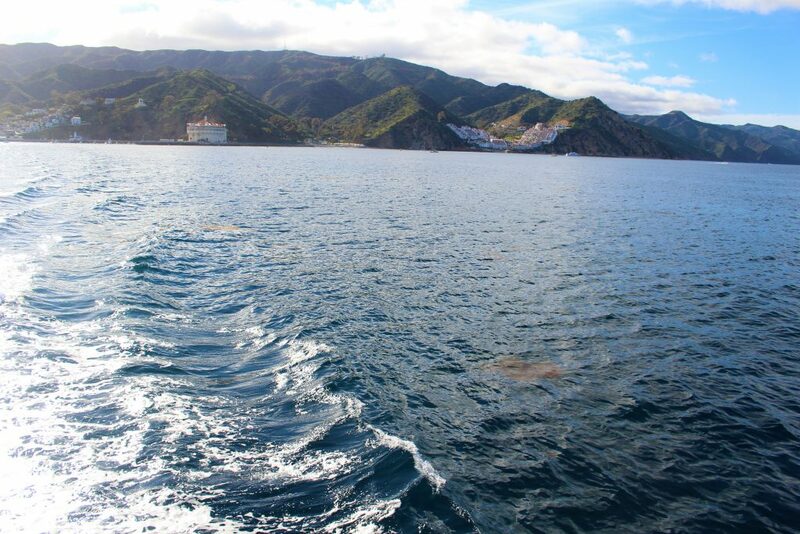 I get seasick (apparently), but I want to try again in the Caribbean or up to Alaska! I would LOVE to do an Alaskan cruise. 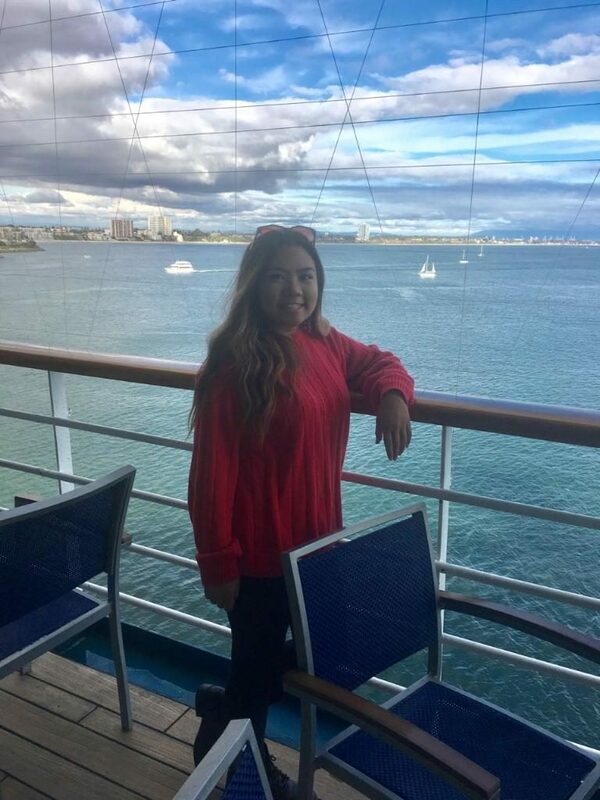 I loved this cruise and yes, seasickness can occur especially if it’s something you’re not used to. I used to get severely seasick when I began cruising and it still feels a bit nerve-wracking when you feel the boat rocking side to side. I want to try an Alaskan cruise too, Jamie! That’s on my bucket list and I think it’ll be AMAZING.